Not All Who Wander Are Lost: For all of you who need a reminder . 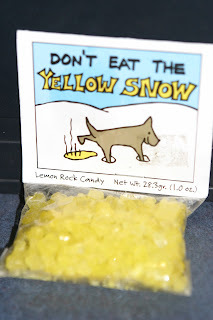 . .
Is it really lemon rock candy? I realize that most of the people who read this are heading towards spring, but it never hurts to have a reminder of common safety items (especially for Nancy who felt that yellow rock candy or gobstoppers might be where it is at). Here at Raytheon Polar Services, they constantly remind us that 'Safety is No Accident.' There might still be a snow storm or two left where you are at. If you are in Colorado, you might even be getting a few more good days of powder skiing. I think my last day last year was around Earth Day on a Tuesday at A-Basin. Going riding is always better than going working. I miss it (and by it, I mean calling off work to go riding). Last night while we played Risk, we enjoyed another spectacular sunset. The sun disappeared behind the horizon at 7:30pm, but was kicking colors up until at least 10pm. Simply amazing. That is never going to get old. South Pole's sun set for the final time a few days ago and, as I understand it, they'll be seeing sunset colors nonstop for at least the next month. 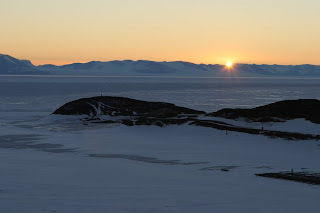 It's good to be in Antarctica, if you can just ignore the cold (Latest weather 14F, wind chill 0F). Sunsets are amazing. You're so lucky to watch the sunlight reflect well after the sun has set. Pictures really don't do it justice, does it? I've finally made it to your site!!! Fantastic :) I love it. Sorry this is short, I gotta run. I'll be back again soon though!